StableSoils of Florida (A Foundation Services company) – Repair A Sea Wall The Right Way! To learn more about Seawall Repair, call (352) 433-2323 or visit our website www.stablesoils.com. Sea walls are engineering marvels built above normal tide or current levels, designed to handle the variations of extreme pressures. Often, however, the soils were never properly stabilized prior to seawall construction. They often come from canal excavation and contain tree debris, aquatic animal remains, etc. that begin to decay, leaving voids and weak zones. As soils behind the seawall begin to weaken, they can create voids that can collapse. Over time, there can be loss of all soil above the lowest water level. Any buildings located close to the seawall will eventually see stress fractures, gradual settlement, then possibly foundation failure, if the soils are not stabilized and the sea wall repaired properly. We see this frequently along Florida coastal developments and intercoastal waterway homes, with a lot of seawall damage activity in the Tampa – St. Petersburg area, Sarasota, Bradenton, Fort Myers, Naples and down around the tip of Florida back up to Miami, Palm Beach, Ft. Lauderdale and north. The abundant limestone erodes over time, spurred on by massive flooding or washing from hurricanes and other storms. Stable Soils of Florida has been delivering superior polygrout soil stabilization and sea wall repair services to these and other communities throughout Florida for over 80 years. To repair a seawall properly and stop the loss of soils, the seawall must be sealed AND vented to alleviate the extreme pressures. During heavy rains, the soils must be able to “exhale” the extra rainwater into the adjacent water body to avoid extreme hydraulic pressure being exerted on the seawall. Without that, seeking the least path or resistance, water will eventually find a weak area (panel joint, attachment anchor) or crack a panel… or worse, exit underneath the seawall panels taking soil with it. 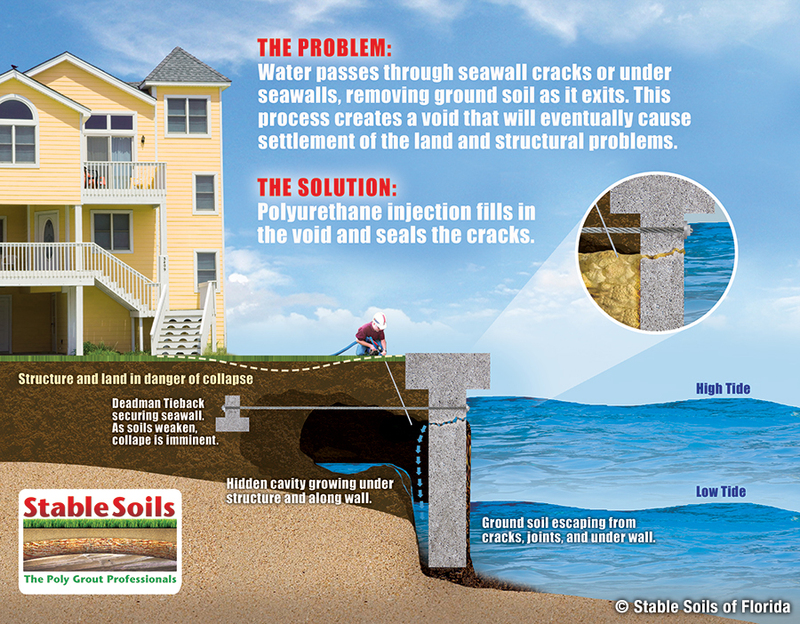 Our StableSoils repair method is a two-part process involving (1) addressing the soil drainage and venting and (2) injecting our rigid polyurethane soil stabilization resin into and below the soils directly behind the current seawall panel to create a rock hard, water tight mass of impermeable soil. It’s quick, clean and quiet! There is no heavy equipment used (only small, truck-mounted pups) and minimal noise. Because the product is injected, there is no unsightly evidence of repair. Click for more information for your seawall.